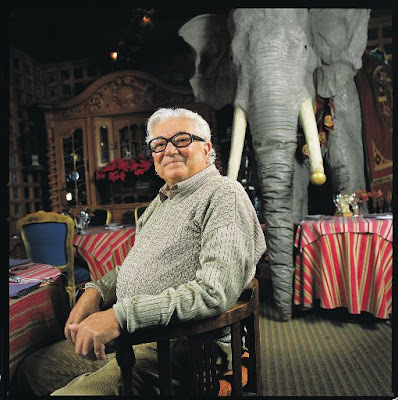 Joe McDonnal was the Merlin of memories — a cook, a caterer, a restaurateur, a creative artist with an eye for design and a man who made magic wherever he went. Parties? He threw a few. Like the time he catered a leap-year birthday bash at his Market Place Caterers, purposely flooding the long entry, then placing steppingstones in foot-high water, inviting guests — men in tuxes, women in heels — to “leap” their way in. At the Seattle Asian Art Museum, he created a grand illusion by lining the walls of a nondescript room with aluminum foil, lighting candles that turned that room from gloomy to glamorous for an intimate dinner party. But his piece de resistance was The Ruins, the private dining club near Seattle Center that was the talk of the town from the moment he opened it in 1993 with his partner in life and business, Virginia Wyman. Mr. McDonnal, 79, died of pneumonia Jan. 31 in Palm Springs, Calif. When Speight Jenkins arrived in 1983 as general director of Seattle Opera, he made the rounds at parties in his honor. They were inevitably catered by Mr. McDonnal, with whom Jenkins forged a friendship of nearly 30 years. “He almost never missed an opera,” said its director. Several years earlier, Kent Stowell and Francia Russell, founding directors of the Pacific Northwest Ballet, met Mr. McDonnal at his Market Place Caterers, then in Pike Place Market. “The friendship was immediate,” recalls Russell, who will miss the “dozens of gorgeous roses” she’d find on her doorstep every year on her birthday, courtesy of Mr. McDonnal. Russell’s son, Ethan Stowell, was 10 when he met Mr. McDonnal. “He had big, flowing white hair, a big smile, and big energy — more than any man should have,” remembers Stowell, the acclaimed chef and owner of four Seattle restaurants, who credits Mr. McDonnal for catapulting him into the business — by offering him a job at The Ruins. “Joe was one of the big reasons why I got into the industry, and why I liked it.” It would take a half-hour to name all the people who worked for him, and later opened successful restaurants, Stowell said. Among them, Joanne Herron. “He was my one and only mentor in the business,” said Herron. She took a job arranging flowers at Market Place Caterers. “He saw something in me I didn’t know I possessed,” she recalls, promoting her to service manager and later to administrative assistant. Twelve years later, she left to open Seattle’s hugely successful French bistros, Le Pichet and Cafe Presse. In addition to Wyman, Mr. McDonnal is survived by his sister, Maribel Cadmus, of Salem, Ore.; and brothers Bill McDonnal, of Los Altos, Calif., and Fred McDonnal, of McMinnville, Ore. A funeral Mass will be at St. James Cathedral, 804 Ninth Ave., Seattle, at 2:30 p.m. Thursday. Remembrances may be made to Seattle Opera, P.O. Box 9248, Seattle, WA 98109 or to Pacific Northwest Ballet, 301 Mercer St., Seattle 98109.